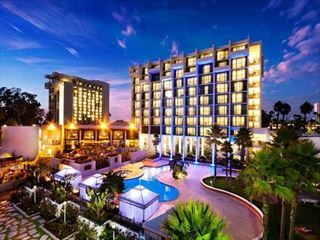 A laid-back resort-style hotel immersed by 26 acres of beautiful landscaped grounds, Hyatt Regency Newport Beach offers complete relaxation on your Californian escape. A modern beach sanctuary, the property features beautiful views over Newport Bay and is within easy reach of the area’s main attractions including gorgeous beaches and bustling shopping spots. The rooms are contemporary and spacious, providing a comfortable respite at the end of a long day of sightseeing and beach-hopping. Dine on delicious local produce at the seafood grill restaurant, where fresh ingredients are given a classic American flavour; there’s also a lobby lounge where you can unwind with a cocktail or a latte. From volleyball to golf and cycling, the hotel has a great selection of activities to make the most of, as well as a concierge service. Hyatt Regency also boasts three outdoor pools – the perfect spot for enjoying the blissful Californian sunshine. 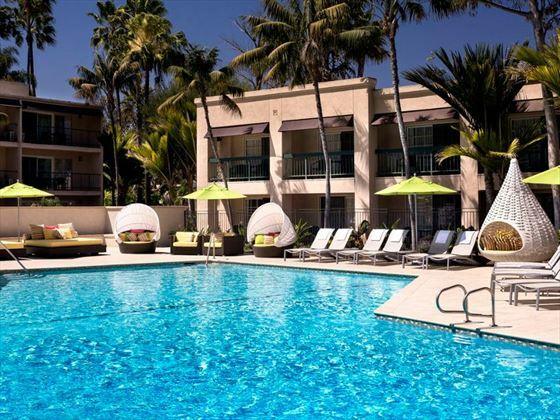 The hotel is set amongst 26 acres of landscape on Newport Beach, overlooking the Back Bay and within easy reach of the shops, restaurants and attractions of the city. Nearby points of interest include Laguna Beach, Catalina Island and Disneyland® Resort which is just 20 minutes from the hotel. The hotel has 497 rooms in total. The hotel also has accessible rooms available.